You’re gearing up to redesign content. The game plan is to transform your site with user experience in mind. But before you begin, you need guidance. This is where a UX audit comes into play. And in this post, we’ll walk through a simple UX audit template for making suggestions to peers and clients. Let’s dive in. What is a UX Audit? Before we lay out the UX audit template, let’s quickly break down UX auditing. User Experience is the experience visitors receive when on your site. There are a number of factors playing into UX. These include messaging, usability, and features that add creditability. Good UX is important from a business perspective. Because it leaves visitors with a satisfied perception of your site. This makes ongoing audits key to user engagement. Begin your UX audit report with a professional looking cover page. The report should include a report title and your name. This makes it easy for your audience to get in touch with you for more details. It also boosts your visibility within the company. Your UX Audit is going to be shown to upper-level marketing management, so your report should be easy to understand. This means using simple language and visuals to drive home your points. To do this, make use of a PowerPoint slide deck. Website Bounce Rate and Time On-Page for a meaningful period of time. Page Messaging – Looking for business driving language. 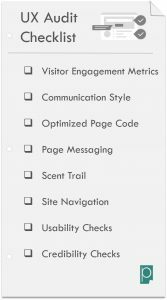 Scent Trail – Analyzing page consistency. Navigation – How simple it is to navigate your site. Credibility – inducing brand trust. 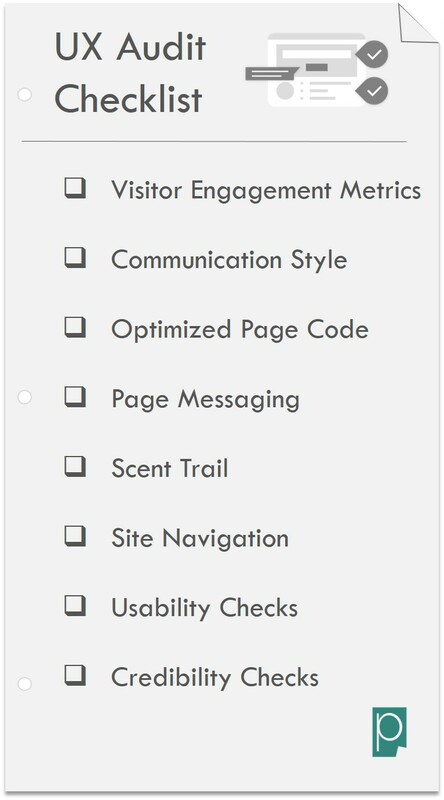 Marketers can analyze these UX features using Pagezii UX Analysis Reports. And for bounce rate and time on page data, web analytics software such as Google Analytics can provide these insights. Start your report with a snapshot of visitor engagement. This highlights the drivers behind your UX audit. To do this, use web analytics software. Highlight engagement metrics like bounce rates and time on-page. This helps marketing top brass understand the result of current UX efforts. In the visitor engagement snapshot example below, you’re painting a clear picture. It’s clear bounce rates have remained high and time on page is dropping off. Next, you’ll want to showcase how you’re communicating with visitors. This shows your audience communication alignment. Your content communication style goes a long way in user experience terms. If communication doesn’t match with your visitor preferences, it could result in a poor experience. Page code isn’t an on-site UX aspect – however, it plays a big role in how visitors find your site. Optimizing page code is the best way to make sure your visitors can easily find you. This adds to an overall user experience. Showcase how well-optimized your page code is. This is going to improve search engine rank and better align your content to that user search. The goal of your company site is to generate business. And to do this, you’ll have to check that business-driving language is featured on your site. Highlight if key messaging factors like CTAs and testimonials are present on your site. These are quick wins you can show to Top Marketing Brass. A consistent theme and messaging throughout the content resonate with new site visitors. In your UX Audit, check to see if main messaging points are present in headings and subheadings, and throughout body text. Sites with strong navigation help users move through site content with ease. Good navigation plays a big role in improving engagement metrics (bounce rates and time on-page), so make sure your audit include a navigation check. Strong navigation clearly maps out internal links to home page and important sub page content and limits the number of leaks resulting in site exits. We’re now getting into the nitty-gritty of UX. In this section of your audit, you’re showcasing usability features such as visual breaks and digestible content. A check on these design features is key in your UX audit. Use this data to guide your website redesign moving forward. This is the last stop on the UX audit template. Here we’re looking for brand credibility builders that all company sites should use. These are site features such as a copyright information, privacy text, and visible social profiles. These features showcase to visitors that your company is established, adding to the overall feel of your site. Before you begin your redesign, or during your redesign process, an audit guides your next move. It’s no good going through a redesign process, only to end up with a prettier version of your previous content. Make sure to use this template at each stage of your design process and help your end product hit home on UX. These are just a few UX checks. Would you include any others?